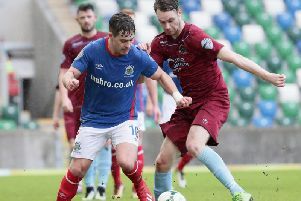 Institute striker Joe McCready shields the ball from Linfield's Jimmy Callacher during today's game at Windsor Park. TODAY could be the day Linfield sealed the Danske Bank Premiership title. While they secured a deserved win over Institute, their nearest challengers Ballymena United, surprisingly lost at home to Glentoran. This display won't live long in the Linfield fans memories, as they never really hit top gear, but in truth could have won by a bigger margin, as Stute rarely threatened. While Joe McCready worked hard up top on his own, the visitors didn't test Blues keeper Gareth Deane until the last minute, while at the other end Marty Gallagher and his defence had to work hard all afternoon. However the visitors game plan of defending well, frustrate David Healy's side and try to nick chances on the break, worked perfectly in the first half. 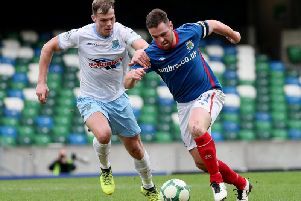 Linfield, who went into the game having lost their last two games, made four changes to their side which lost to Crusaders in the County Antrim Shield Final, with goalkeeper Deane, skipper Jamie Mulgrew and strikers Joel Cooper and Daniel Kearns all coming into the starting line-up. As for Stute, Caoimhin Bonner returned from a recent ankle injury, to replace Jamie McIntyre, who dropped to the bench. The home side had two half chances in the opening eight minutes, firstly Andrew Waterworth's close range strike was blocked by Dean Curry, while Kearns' low drive, from the edge of the box, was saved by Stute keeper Marty Gallagher. Institute themselves had a good opportunity just after the midway point of the half, but Joe McCready failed to test Deane, as Stute looked to hit the Blues on the counter attack. The home side should have went in front on 34 minutes as Stewart twisted and turned away from Ryan Morrow before seeing his left wing cross find Chris Casement in the six yard box, but his close range header was superbly kept out by Gallagher. The Linfield right-back went close again two minutes later as his 25 yard curling free-kick, was tipped onto the crossbar by Gallagher. Linfield thought they had taken the lead on 49 minutes but Jimmy Callacher's close range header was ruled out for offside. Institute were inches away from taking the lead against the run of play on 58 minutes, as McCready's left wing cross with the outside of his right boot, found Dean Curry at the near post, but the skipper's close range shot hit the side netting. Curry went even closer to scoring, but this time at the wrong end, as he headed Niall Quinn's corner towards his own goal, but fortunately for the centre-back Jake Morrow was on the line to clear. The visitors did take the lead on 62 minutes thanks to a stunning strike from Stewart. Stute were unable to clear their lines properly and as the ball fell kindly to the ex-Glentoran man, he made no mistake from just inside the box, firing high into Gallagher's top right hand corner. Linfield went close to doubling their lead four minutes later as Cooper's clever chip over Gallagher was goal bound, but for Bonner heading off the line, before Curry headed Quinn's follow up effort away from a corner. From Quinn's resulting in-swinging right wing corner Joshua Robinson made no mistake, powerfully heading home from six yards. In the closing minutes Stewart saw his left wing centre flash across the Stute six yard before Colm McLaughlin cleared the danger. On 90 minutes Deane had to produce his one and only save, getting down low to his left to keep out Paul Smith's well hit 20 yard effort, after Ronan Wilson's clever dummy created the chance for the substitute. Linfield: Deane, Casement, Robinson, Callacher, Quinn; Mulgrew, Mitchell, Stewart; Kearns (Cervenka 80), Waterworth (O'Connor 80), Cooper (Clarke 71). Institute: Gallagher, R Morrow, Bonner, D Curry, McLaughlin; S Curry (Moorehead 82), Jarvis, Wilson, J Morrow (Smith 69), Dunne (McIntyre 64); McCready.